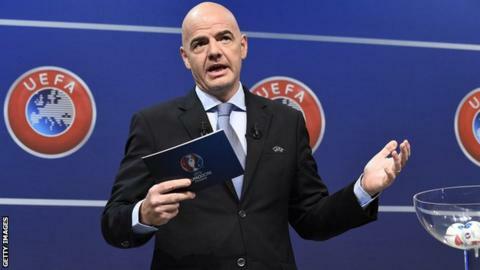 Gianni Infantino's first key decisions as the new Fifa president will be made in Wales on Saturday. FAW president David Griffiths will chair the 130th International Football Association Board annual general meeting at Cardiff's St. David's hotel. Infantino, 45, beat closest rival Sheikh Salman bin Ebrahim al-Khalifa in February's election in Zurich. He succeeds fellow Swiss Sepp Blatter, who had led world football's governing body since 1998 and stood down in 2015. Blatter was later suspended from football for six years for breaching ethics guidelines. The FAW was represented in Zurich by chief executive Jonathan Ford, and Wales supported Infantino's bid to become president. Saturday's meeting will see plans to revise the laws of the game discussed, including the topic of video assistance for match officials. The introduction of 'sin bins' and the possibility of allowing a fourth substitute are other options on the agenda. The IFAB consists of the following members: The English Football Association, the Scottish Football Association, the FAW, the Irish Football Association and Fifa.